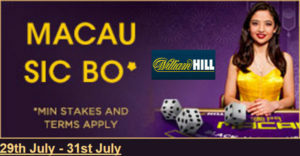 There is a special William Hill live Blackjack promotion running only on the Macau Blackjack tables Macau BJ28, Macau BJ18 and Macau BJ8. 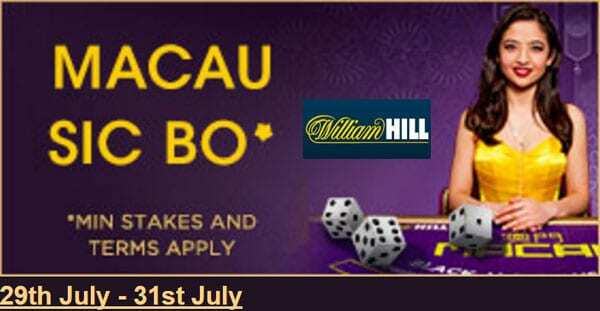 The promotion runs Friday 29th July to Monday 1st August 2016. 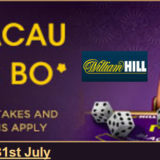 Each evening between 19:00 – 01:00 GMT the casino host will visit the tables 40 times and hand the dealer Seven Dragon cards which are number 1 to 7, corresponding to each of the player positions on the table. The dealer will pick one of the Dragon cards at random which will then be turned face up to reveal the wining box number. If no one is sitting at the drawn box number another card is selected until a winner is found. The dealer will then roll the 3 Live Sic Bo dice. The total of the 3 dice will determine the prize won. If it’s a 4 and the player will win £25. If it’s 5 – 7 the player will win £15. If it’s 8 – 13 the player will win £5. If it’s 14-16 the player will win £15. If it’s 17 the player will win £25. If a treble is thrown, i.e. 1-1-1, 2-2-2 etc the prize will be £50. The cash prize will be paid into the players account within 24 hours.